I admit it. I shamelessly copied Bryn Anderson and her dog Nixe’s incredible Halloween costume idea. And since Haley already has the triangular shapes around her eyes from her naturally graying face, it just seems like it was meant to be. She’s going to be a skeleton dog for Halloween this year! But don’t let my lack of creatively stop you. Design your own canine creation for Halloween (or any occasion) with this dog safe paint from Dollipop Cosmetics on Etsy. The paint is a non-toxic mineral powder that you mix with water, coconut oil or pet-safe gel. Just mix it up and paint any design on your dog’s fur. 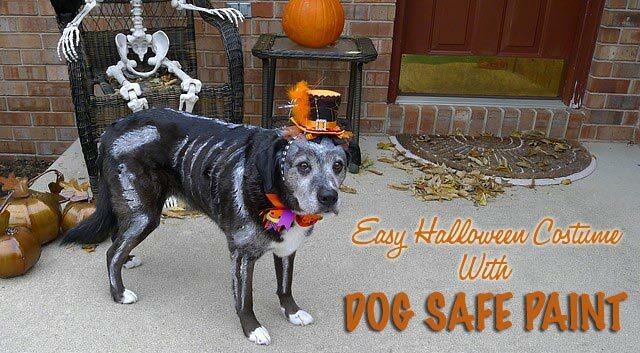 It’s perfect for pups that don’t like wearing traditional Halloween costumes. I mixed the white mineral color with a gel, then used a large paint brush to spread on the color. Haley’s not quite as patient as Nixe with the whole process, so my design was anatomically and artistically flawed, but the gel dried nicely and the color stayed in place well. 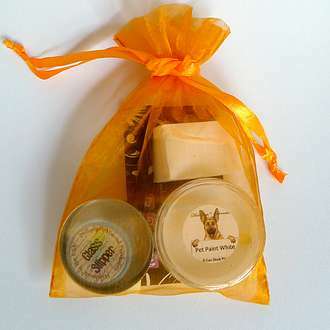 The mineral paint comes in different colors and you can also request a custom order made specifically for your pet. 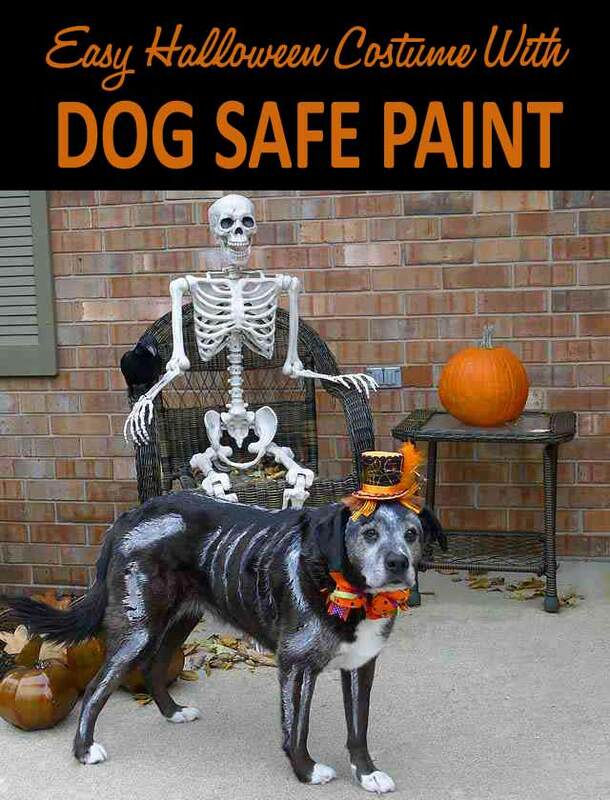 Thanks again to Bryn and Dollipop Cosmetics for creative inspiration and dog safe paint products and be sure to check out these 10 Halloween tips for your pup. 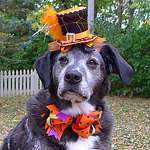 Do you plan on dressing up your pet this Halloween? Leave a comment and tell us about it! I wish I could take credit for the idea, but she does make a pretty cute skeleton, haha! Happy Halloween Happy and Hazel!? What a cool idea! Ruby is OK with costumes as long as they are not to hot or confining. I’m glad to know the paint isn’t toxic. I’ve seen dogs painted and wasn’t sure. I’ve seen some dog paints that have alcohol and other chemicals, so I guess it’s always good to check the ingredients just to be sure. Have a super spooky Halloween! That is an awesome paint job! It would be hard for us with all our spots and colors to really use the paints to make something look that good. We did use dog chalk once and that worked sort of for solid color. I haven’t heard of dog chalk before. I’ll have to check into that, Emma. We are thinking Haley is positioned to rake in the Treats this year!! Love her look – so cool! Thanks, Donna! If Haley had it her way, she would stick her head in all those kid’s candy buckets and gobble up their treats, lol. Great tip to be careful around the eyes!?? Cooper would look awesome as a bee or maybe a tiger! I’ll be on the lookout for some pics if you decided to embrace your artistic side.? What a great concept and my guys wouldn’t mind the paint nearly as much as they mind costumes. I should give this a try and I love the skeleton look — it’s fabulous. Thanks for sharing this – I’m still thinking of ideas for costumes! There are so many cool ideas out there for dog costumes now. There’s a small town not too far away from us that has an annual pumpkin festival and pet parade. It’s always inspiring to see what people come up with. I love that costume! Great way to incorporate her gray muzzle. Mia’s getting so white I think she could go as a ghost! Oh my gosh, Mia could be a reverse skeleton! Haley gets more gray every day, so they’ll probably look like twins soon, lol! That’s so cute! 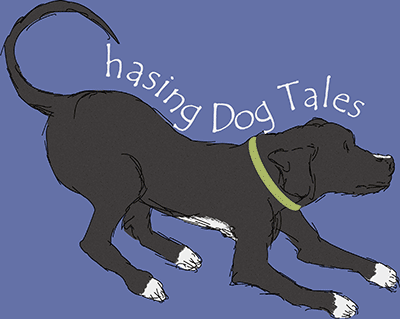 I used to know a yellow lab whose dad would paint black stripes on her like that – sort of a reverse skeleton. Wouldn’t work so great with Rita being tri-colored, but I’m sure she’d prefer that to an actual costume! Anyway, she won’t be dressing up. She’s not a fan. Also not a fan of folks coming to the door, so even though I love Halloween, we’ll just be hiding out with the lights down low! No worries, I’m sure those kids will have plenty of candy and you guys can relax with Rita and give her some TLC. Don’t you wish doorbells had on/off switches? That sure would come in handy at Halloween time, haha! Thanks, JoAnn! Wishing you all a Happy Halloween.? I think that’s super cool. In my neighborhood we all come outside and sit in our driveways as the kids trick or treat. This paint gives me an idea – I can paint circles on the Boys and they can be Chick-fil-A cows! Thanks! If you’re feeling extra enthusiastic about the holiday, you could give away Chick-fil-A gift certificates, lol! Buzz and Missy would look fabulous as zebras! I hope you guys have a Happy Halloween!? That is adorable! I love how you incorporated her natural coloring into the costume. My crew is surprisingly tolerant of costumes, especially the wee Boston terrier. But I’m not sure we’ll be dressing them up this year. We’re not heading to any dog-friendly parties this year. That sounds just as desirable…staying home, relaxing and pampering the pooches. Enjoy!